It seems aliens have left Crop Circles in the Muck. Either that or a Hodag has gotten lost. 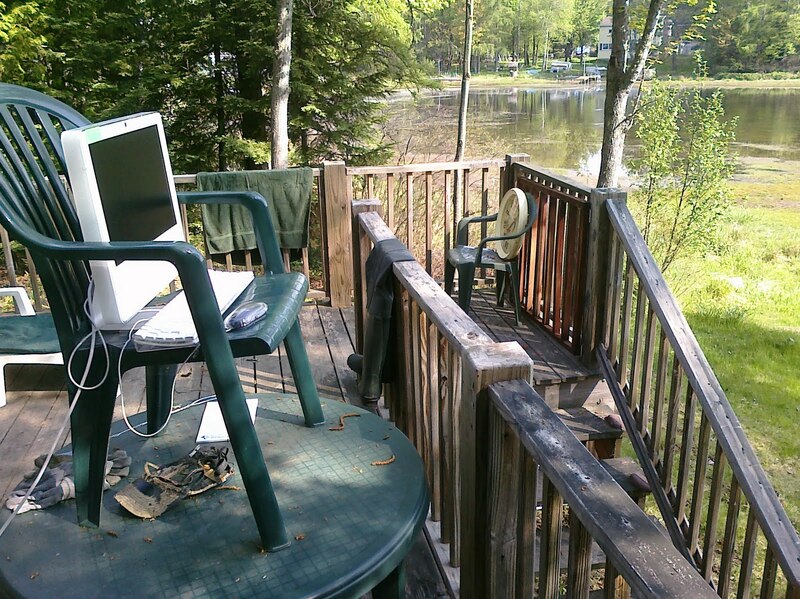 Let's hope a mild breeze doesn't knock the delicately balanced imac off the plastic lawn chair, delicately balanced on the plastic lawn table. Yes, let us hope. The iMac does have something of a sail-like quality. And the wind is picking up. 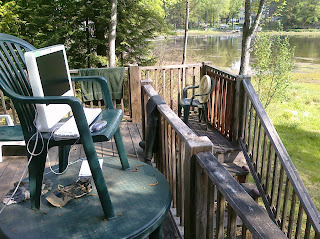 The best thing that could happen to the iMac is for it to be dropped into the lake. Unfortunately I am doubtful that it would be as beneficial to the lake. Perhaps gift it to brother, I am sure he would worship it as the divine creation of Steve Jobs that it is. I will tolerate no racism, sexism or religious intolerance on this blog. As you should know, this is a long standing policy. All are welcome here - Jews, Muslims, Presbyterians, Papists, Hindu, Mormon, Druids, Wyccans, and yes - even Jobosians. Frankly, I am surprised and disappointed in you. Making fun of other religious beliefs does not seem consistent with your liberal sensibilities. Sure - the beliefs and sacraments of the Jobosians seem weird and almost laughable to any rational human being. But let us be honest - are their beliefs really any stranger than say - the scientologists belief in Xenu? Ok - the Jobosians are admittedly weirder than scientologists. No matter. Intolerance is intolerance. I insist you apologize to Anon for insulting their religion. Oh, OKAY than. Many apologies to Anon -- I had no idea it was your brother hiding behind an electronic cloak of anonymity. If only he had the courage to put his name behind his words. I suppose I should pay closer attention to this blog, but no - I am not anon. Although I do agree with anon's sentiments, as It was MW and myself that purchased the imac for Papa five years. It is amazing that the apple hardware for a cheap computer like that is so robust.